AVONDALE, AZ, Sept. 22 -- In September, Estrella Mountain Community College (EMCC) received the 2018 Red Hat Academy Director’s Award at the Red Hat North America Training Partner & Instructor Conference in Las Vegas. Red Hat, Inc. was founded in 1993 and is a multinational software company that creates open source software products for the enterprise community. They are best known for being a major vendor of the Linux computer operating system in America. 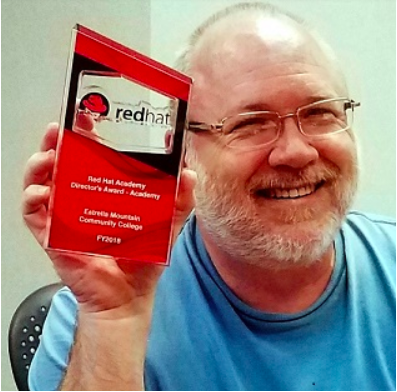 Tracy Baker (RHCSA, CCNA, CCNAS, A+, Linux+, CRLA), a faculty member of EMCC’s Instructional Computing Division -- and leader of EMCC’s Red Hat Academy -- received the award for work he did to convert Red Hat’s enterprise training materials to those more suitable for use in academia. “I rewrote specific Red Hat content that we teach in several Computer Information Systems (CIS) courses on campus to create measurable assessments that I could use as a college professor,” Baker says. He started using the first revisions of the newly rewritten labs during the latter part of the fall 2017 semester and says that he is seeing an increase in student understanding of the Red Hat Linux operating system and how to administer it. He notes that his enhancements have made the coursework more challenging and rigorous. While he’s thrilled to have received the award, Baker is equally excited to grow his programs. “I do get a warm, fuzzy, feeling for being recognized for the work I did. However, I’m not finished. There are still revisions to be done (my students seemed to be very skilled at pointing out my typos and other errors). My next major project is to create more critical thinking and problem-solving labs for the Red Hat Academy. Employers, especially ones in IT, love people with good problem-solving skills. Baker thanks Jim Nichols, Tom Polliard and Eric Eckert for their suggestions and ideas that helped him facilitate this project, as well as Jonathan Heard who helped test the changes.